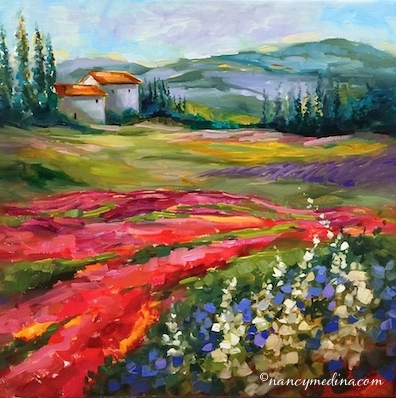 Little French Houses is the daily newbie in Flower Mound Studio, I've been having fun with my photo library from Southern France this week, and sense a few more of these landscapes will be appearing on my easel. I got a note from a follower in Canada this morning suggesting I open up my blog comments so that people can comment, even if they are not on Google Plus. I had no idea this restriction was there! I remember the old days when it was just plain old blogger (do I sound like an old granny here?) and things were so much easier! I will see if I can try to adjust the settings, turn the knobs, fix the thingy ma bobs, so more people can comment. Thank you so much Linda for letting me know, and warmest regards to chilly Canada from sunny Flower Mound, Texas!